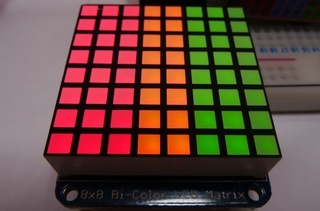 This guide shows how to communicate with the HT16K33 “RAM Mapping 16*8 LED Controller Driver with keyscan” device, which can control multiple 7 segment LED and 8x8 RGY Matrix (3 colour:Red, Green, and Yellow - Red+Green) using only 2 phatIO pins (plus 5V and GND), in fact upto 8 of these devices can be connected to phatIO whilst only using 2 pins (in the following 4 devices were connected). 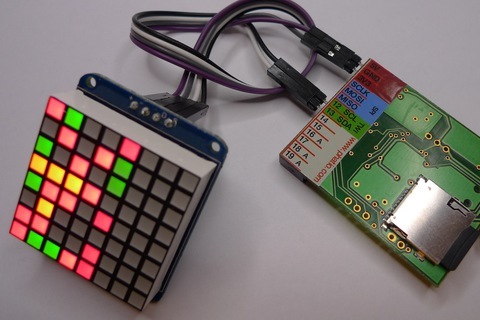 Adafruit LED Matrix and 7-Segment ‘backpacks’ and other products (what - please mail if you have links to other products). This guide concentrates on how to communicate with the HT16K33 from the phatIO it is not an introduction to the internals the HT16K33 device - for that read the HT16K33 datasheet. Copy run.lio (in the resources sidebar) to PHATIO/io/run.lio on your phatIO device. 4 pins are required to connect to HT16K33 devices (left) to phatIO (right): 5V and GND, and SDA (pin 13) and SCL (pin 12). These are labelled: VDD, VSS, SDA, and SCL on the HT16K33 chips, and +, -, D, C respectively on Adafruit backpacks. The 8 bit TWI address of the HT16K33 device will be in the form 1000AAAX, with AAA being the address of the specific chip (see page 26 of the datasheet) and X denoting read (1) or write (0). We’ll assume an address of 000 so the TWI address is 0xE0, change the code to reflect your setup. Multiple HT16K33 devices can be connected to the same 4 pins as long as they have been given different address. The code above defines a variable to store the device address and then a function to initialize the device by sending 3 TWI messages to setup configuration registers. Sets the LED intensity (page 15 of the datasheet), 0 is minimum, 15 is max. This is logical ORing 0xE0 and 15.
would result in the 16 bytes each represented by 2 hex characters in the file (‘FF’ = 0xFF = 255) being sent to the ht16k33 which it will result in the LEDs lighting appropriately, depending on device. Note that replacing read_hexbyte with read_byte and incrementing over each byte the device file we could use raw binary data rather than hexadecimal. The video below shows a small ruby script (matrix.rb) writing columns/rows, colours and random data to an RGY and mini mono matrix in turn. Note that Red and Yellow don’t show up that well ont the video. 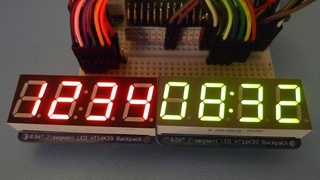 Upto 8 7-segment displays can be controlled with an ht16k33, instead of the bits of each byte controlling the pixels of the LED matrix, they control the segments of the display, so 0xFF would turn on all segments, 0x00 turn them off. raw-7segment.rb contains an example ruby script that counts from 0 to 9999 converting the number into correct binary segment values and writing to the mono device defined above. The extract below (in the examples/ht16k33/run.lio) defines a very simple driver which will treat the contents of the device file “PHATIO/io/dev/time” as a 4 digit ASCII time converting the digits to the appropriate 7 segment values. So writing “1234” would result in “12:34” being displayed. (- (read_byte 0) '0') will read the byte at position 0 in the device file (the first character) and subtrace ASCII value ‘0’ from it, this will map character “3” to number 3, “5” to 5 etc. We then use this as an an index to getvar to get the nth member of the cmap array which is contains which segments to display for the relevant number. If getvar receives an out of bounds index (less than 0 or greater than 9 in this case) it will return 0 - which will result in a blank digit on the display. So “ 33” and “xx33” would both be shown as “ 33” on the display. Also is included is an address driver which allows the address of the device to be changed at runtime allowing multiple devices to be addressed - another approach to this would be for the device address to be in the first byte of the device data file.